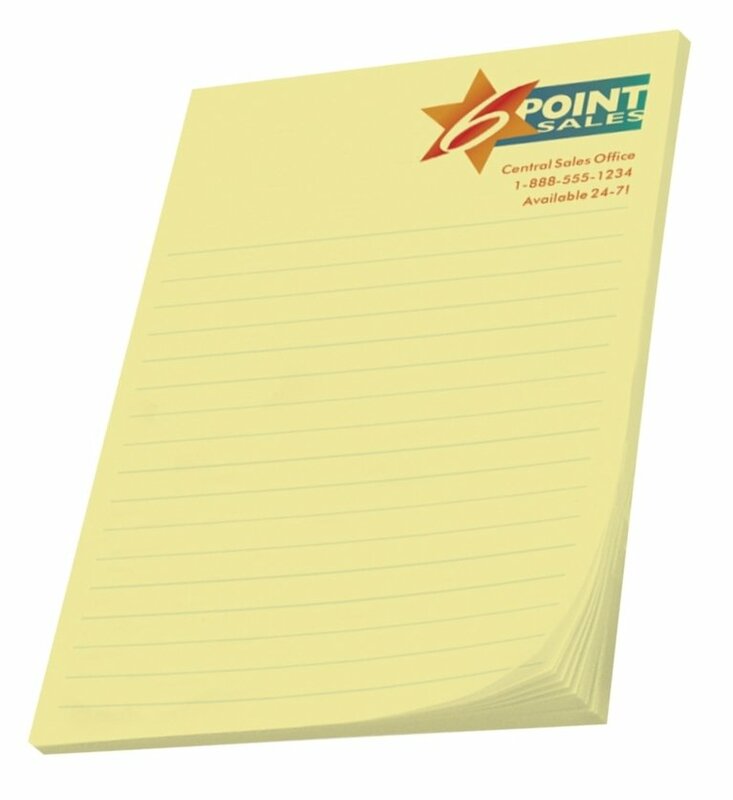 Custom printed 4 x 6 Original Post it Note Pad with your logo. Buy this Post it for Std. paper colors & printed in PMS inks. 50 sheets 4 wide x 6 high, adhesive sticky on the 4" side. For Super Sticky with 1 inch high adhesive add 10 %. Super Sticky pads, no imprint in the adhesive area. Super Sticky pads are available in White paper. Delivery from date of an order is 2-3 weeks. Post it Note Pads are Made in the USA. Price includes a one color imprint in area 3 5/8" w x 5 1/2" h.
please contact us with order quantity for current price. PII recommends Full Color Post it's for multi colors. Logos do require Illustrator ai, eps, or pdf art file. This is our first order with PII and it turned out great. We were getting some cut-rate sticky pads from another company but the imprint was inconsistent and the ends curled up. I am so thankful our rep insisted that we try an order of the 3M 4 x 6 Post it Notes. They did the artwork for us and our logo, contact information was professionally performed and printed on the pads. We will order again and I am going get some of the Bic Media Clic Pens he suggested as well. We Are Happy and Ready For Those Orders!!! Our response Dear Samantha-We are thrilled when you are happy and that is the full measure of a satisfied customer. As your account executive I promise to maintain your confidence in PII and will call you Monday am.